Grab your best pals and come celebrate LADIES! 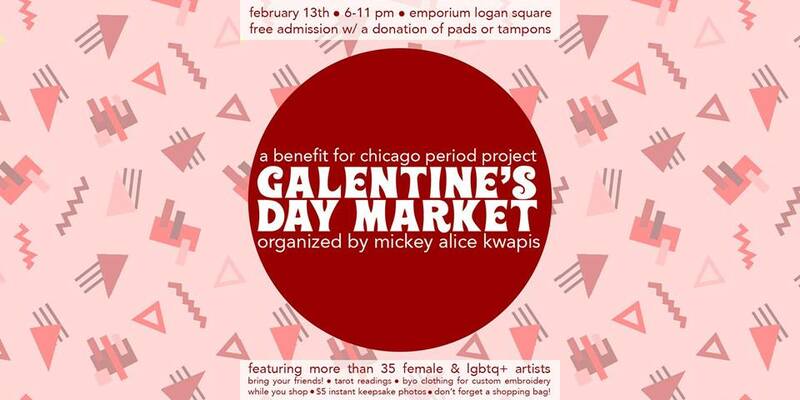 I've rounded up more than two dozen of Chicago's best female and LGBTQ+ artists to create a one-of-a-kind shopping experience. What's Galentine's Day? Oh, it's only the best day of the year! We've got drink specials, arcade games, pool tables, a photo booth, tons of local businesses to shop from, and the best part? We are accepting NEW UNDERWEAR, pads, tampons, and other menstrual supplies for the 29% of women living in Chicago under the poverty line. These products will be distributed through shelters, schools, and other public programming. Find out more at www.chicagoperiodproject.org. VENDOR APPLICATIONS ARE NOW CLOSED. Vendors will be announced shortly. If you missed the application deadline, please sign up for email updates at www.mickeyalicekwapis.com for notifications next time. We DO need volunteers, so if you are available to help out for the duration of the event, starting with set-up at 4 pm, please email hello@mickeyalicekwapis.com.